arters of sales reps are failing and that 25% are hopeless. Kurlan bases this assessment on the evaluation of 700,000 conducted through their sales aptitude profile. The study says that 6% of salespeople are “elites” who are great at selling, while another 20% of good, but could be doing better. Dennis Connolly, a VP at Kurlan, says that it doesn’t matter the industry or the company, the results are always the same. Desire: How badly do you want to be good at sales? How high will you set the bar? Comitment: How committed are you to meeting goals? What are you willing to do to get over the bar? Responsibility: Are you the kind of person who blames others when you fall short, or do you take responsibility? Outlook: In general, how happy are you with your life, with your company, with yourself? There’s a good synopsis of the study by Dan Lyons on HubSpot’s opinion blog. I thought it would be worthwhile to share my thoughts. 1. There’s a Fundamental Flaw in the Outlook and Analysis of the Study. For some reason sales seems to be the last discipline where results are viewed through a behavioral prism. There’s an old saying that says if everyone around is you a turkey, you’re probably the turkey. Well, when 74% of a large pool of people are failing, you’ve got to stop looking at the individuals as the cause of the problem, and look at the system. While Kurlan’s study points out that there is a lack of formal training in many instances, it’s not a training problem. As the 2009 Challenger Study conducted by the Sales Executive Council proves there’s a fundamental flaw in the beliefs of how companies should be selling. Until that flaw is fixed, you’re just rearranging deck chairs on the proverbial Titanic. Solving this problem – and it’s a HUGE problem – requires that executives take a systems approach to building predictable sales growth and results. By the way, the #1 cause for poor sales performance is ineffective lead generation. I agree with the findings of the study. Roughly 10% of performers are geniuses and will succeed no matter what the situation is. Roughly 25% of salespeople in the business would be better served doing something else. The game is won with the middle 2/3rds. The problem is that most people – and most training systems – are all focused on the elite as the model for success. Now, before all the Topgrading trolls out there start throwing “A player” terminology at me, please don’t get me started. Focusing on core performers does not mean focusing on average performance. It’s about getting core performers to perform to produce top results (which, by the way, requires a systems approach). They’re successful regardless of the approach. Truly elite sales performers are beyond the reach of most small and mid-sized businesses. By focusing on the core, you shift the performance curve with a broader base, with higher ceilings, allowing you to yield bigger results for the organization. In my experience, a major cause of sales ineffectiveness (other than the system) is a mismatch of roles. 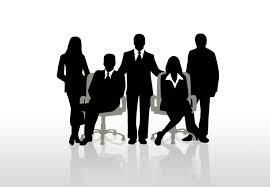 Executives toss around the word salesperson to describe a variety of functions. 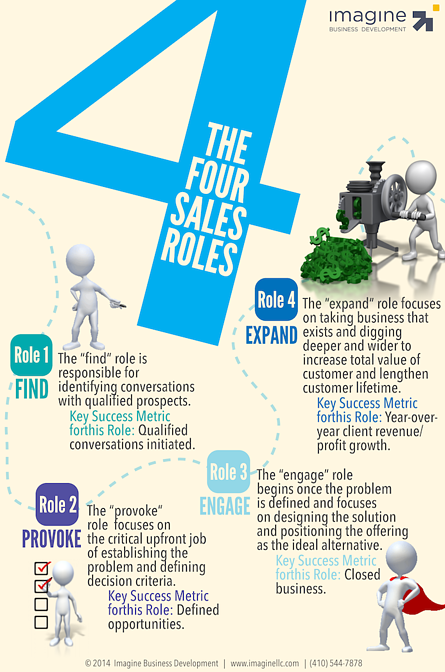 As the infographic shows, there are four distinct roles that salespeople play, each requiring a unique set of skills and talents. It is critical that you align the right talent with the right role. The bottom line is that “sales” and “salesperson” have bad names. In today’s complex world, those people who could excel in B2B sales simply aren’t interested in playing the game – and why should they? The future of profitable business growth requires that we transform sales to a more professional discipline that is attractive to bright, insightful people. We need to allow professionals to, well, feel professional. We need to support them with refined, effective marketing programs that allow them to spend their time on high productivity actions. We need to eliminate the “smiling and dialing,” and “art” that so often describes the sales function; and transform it into a predictable, sustainable and scalable system. We’ve done that with operations, manufacturing, finance, IT, marketing, and we must do that to the sales function. Companies that succeed in that effort will be able to recruit from a fresh pool of candidates that their competitors have no chance of retaining. And that’s when we’ll begin to see a meaningful change in success metrics.